A few years ago I opened up a discussion, inviting locals to share their scorpion sting experiences. I received hundreds of responses; here are 99 of them. You'll notice some repetitive themes — walking outside barefoot or in flip flops, for example. Most of these people had "normal" reactions to the scorpion stings, but some were more severe and frightening. With respect to the anecdotes that follow, some have been edited in a minor way, mostly for spelling or grammar, without changing the message. I deleted comments not directly related to the sting issue. For example, many people seemed delighted to share an explanation of how they killed the offending creature. I did not include stories that mentioned unconventional treatment recommendations. They ranged from putting tobacco on the sting to frozen pork chops. Don't do that! I have not verified any of these anecdotes. I publish them because you might find them instructional, or you might find solace in knowing that you are not the only one experiencing reactions from the scorpion sting. I am no longer accepting submissions on this topic. Disclaimer: I am not a doctor, and nothing in this collection of comments is intended to be medical advice. I got stung 3-1/2 days ago on the top of my left foot in my yard in Anthem. Slight pain and numbness which moves around to different areas, also last night 3 days after the sting, was my worst time as my right arm was very numb and I had a weird taste in my mouth that I never had before plus cold sweats which woke me out of my sleep. I also felt weird sensations at times especially after laying down at night plus twitching in my left leg then numbness in my right foot, I am 240 pounds. Not fun and good luck, call poison control for advice. About 11:30 pm I rolled over on my chest pillow and felt a tiny sting. Coming out of my sleep I got out of bed and lifted the sheet as a bark scorpion crawled on my mattress. I trapped him in a empty water bottle & verified it was a bark scorpion. I put a cold compress on it immediately and really had no major discomfort other than a light sting and some local numbness. I was stung late one night and it was horrible. I immediately tried to take an aspirin for the pain, but thought the milk I was taking with it was spoiled as it felt as though it was soaked in a cotton ball. With each heartbeat it was as if I were being stung again, and numbness began creeping up my leg. I finally went to the ER but had to wait quite awhile to be seen by anyone. Meanwhile, I could not even drink water as it felt like wet cotton. When I was finally seen by a doctor, my bp was almost 200. I was given an injection and I remember the doctor telling my husband to look at my tongue as it was flicking incessantly back and forth. I then needed another injection before the doctors felt that I was going to be okay. The entire right side of my body was numb for about three months and then it gradually subsided with my foot being the last part to regain full feeling. Hope I never get stung again. I was sleeping on my side when I woke up to a tingling in my nose. We captured the scorpion later on in the evening at the foot of the bed and I took it to an expert, who identified it as a bark scorpion. I was absolutely panic stricken from the pain and the thought that this thing had been crawling on my face, not to mention how or why the heck it stung me just inside my left nostril. The intense pain lasted 2 hours. Even though I was told by poison control to ice the area I could not have anything touch it. This was followed by a few more hours of severe pain. This was followed by a strange pulling numbness at the site down toward my mouth. Now 11 days later there is still some residual uncomfortable feeling in the area, but I survived and i am sure I will be fine. 15 hours of excruciating pain on foot. Got bitten walking on driveway with flip flops on. Two and a half hours later face went numb, arms went numb and I couldn't read. Ended up in emergency. Top of my ears were numb. Slurred words and could barely drink with swollen mouth. I was a level 3 and level 4 was the level you needed the anti venom. Was observed for 3 hours left the hospital. Was in agony for 15 hours. Regained most of my vision by second day. No more pain or numbness. Two and a half days later toe still numb. Just glad the pain and tingling is over. I worked at an exotic pet store where somebody brought in three AZ bark scorpions inquiring what they were. While I was examining them, one scorpion tried to sting the other. He missed and got the side of my hand. At first, it felt like an ant bite. That was followed by some tingling. The tingling was followed by numbness up my arm which got progressively more localized around the sting site over the course of 3 days. I iced the sting and took antihistamines. We use to live in the Tucson area and our house must have invaded a nest of scorpions, because we were each stung 4 to 6 times. It was like a bad wasp sting lasting a couple hours and relieved by ice packs. 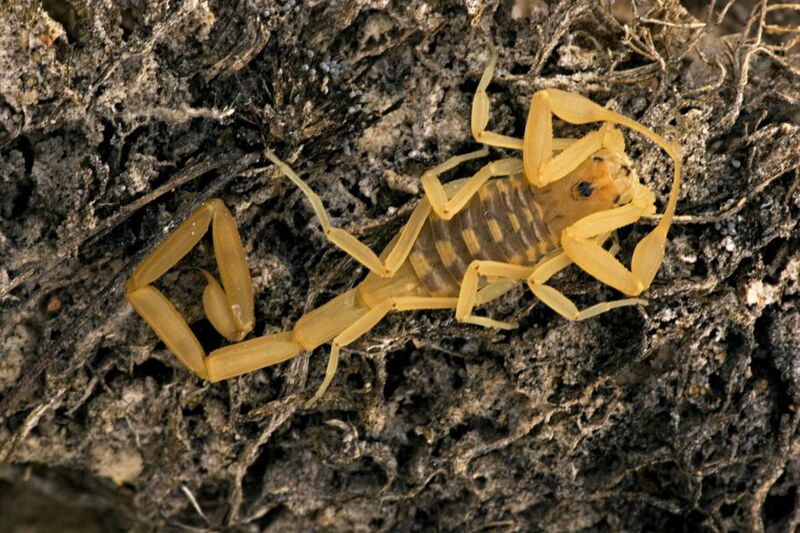 Now we live in the hills north of Sun City and we have lots Bark Scorpions. I was stung on the upper thigh getting into bed 4 times before I could get up and out. The severe pain lasted about 20 hours; it felt as though someone had set worms of hot coals under my skin, wiggling, hot and painful. After 20 hours it was bearable and after 36 hours the pain was gone, but the numbness stayed for about two weeks. I'm 8 months pregnant and after weeks of hunting and killing, I was stung twice by a bark scorpion while getting my prenatal vitamin tonight. At first it felt like I had stepped on a burning cigarette and then immediately followed by intense pain and stinging. Experienced contractions within about 10 minutes, so rushed to our local ER. The pain was one of the most intense pains I have felt, and my entire leg swelled, as well as my throat and tongue. Unfortunately the antivenom is category D (not safe this late in pregnancy), as well as the typical pain medicine, so just a shot of Benadryl and Tylenol is allowed. Going on 8 hours and my leg is still swollen and goes between throbbing from my toes to my upper inner thigh to shooting pains. Be careful while pregnant here in AZ. In my home, a mama AZ bark scorpion with babies on her back fell on me from the ceiling. I was stung multiple times by the babies (babies don't know how to control their venom), so I ended up with quite a lot of venom. I was 25 weeks pregnant, so went to the hospital. I had severe symptoms. Muscle spasms, eye-roving, head to toe tingling numbness. By the third hour, I started having contractions every 2 minutes and started becoming hysterical because I thought we were going to lose the baby. They wanted to give me morphine, but being pregnant I refused. They finally has to sedate me and it helped to slow the contractions which finally stopped on their own by hour 7 when other symptoms subsided. My sting sites remained numb to the touch for over 2 months. It was a terrifying situation. Three weeks later I was stung again on the foot, and only had tingling/numbness up to the knee. Everything was gone the next day. Very different situations. Had to leave for the airport in 10 minutes and was stung on the outside of my left foot just below the little toe. I yelped and jumped, didn't see anything, but knew immediately that a scorpion had stung me. There was nothing I could do, so I took Ibuprofen and headed for the airport. Immediate pain in the foot from the sting and then painful numbness and tingling that progressed up to the ankle. Since we were traveling, I wasn't able to do anything for it until 6 hours later. Took a Tylenol and Benadryl and was able to walk on it, though it was uncomfortable and painful. It felt like extreme pins and needles, intensified every time I bumped the foot, and was numb in the area of the sting. It gradually receded and was finally gone by the next day at 2:30 p.m. (32 hours, not fun!) Wish I could have iced and elevated the foot, but it wasn't an option. I was stung this morning during my workout. I was in my living room, felt like I had stepped on a nail or tack or something. Thought nothing of it at first, then the burning sensation started and I knew it wasn't a nail. I couldn't see anything on my toe, but the burning sensation got worse. I put my foot in running water and let it run. I knew it was a scorpion; my husband found it. Five hours later, I have a tingly sensation, feels kind of like my foot is fat (but it is not swollen), and occasionally there is a sharp pain. I don't feel anything anywhere other then my foot. My three-year-old little girl was stung in her bed. I called 911 right away because I've been stung before and I know the risk for children, they transferred me to poison control and after talking to them for about 30 mins they decided the best option was for the fire dept. to come over. They determined she would be OK. She has been complaining of arm pain and tongue pain for 24 hours now and won't stop crying. I hate these bark scorpions and no pest control will get rid of them. I live in the West Valley. Last night I was stung by a bark scorpion. I felt a sharp like cut down the back of my leg. I'm pretty sure it stung me 3 times. Only little swelling, however a lot of tingling, and some burning. Other then that no sickness even 8 hrs later. This was the second scorpion I have found in this home in 2 months. I think I will move now! I got stung taking out the garbage barefoot. Got stung on my outer pinky toe. Immediately called 911 and they connected my to Banner poison control. They went over all the symptoms (and I got damn near all of 'em) I could experience and reassured me I'd be OK. They called me every two hours to check on me. The pain was terrible. It started off numbing my foot and then the tingling and throbbing pain kicked in. It came in waves, like contractions. I've given birth and this pain is very comparable. The numbness spread for a while to my hands, other foot and even my mouth. Then I couldn't focus my eyeballs on anything. 1:30 AM... Had my arm under my pillow when I felt a pain on my wrist. Rubbed it trying to feel for a scratch or bump then it dawned on me something may have bitten me. Woke the wife up as I was searching around my pillow. She looked under the sheets down by her knee... There was the scorpion that got me. It's been over an hour, no tingling or numbness, just some local swelling and burning at the sting sight. We get numerous scorpions in our bathroom every summer. Now, in January, we got one and it stung my toe. The first few hours I had stinging pain, burning, and swelling, but limited to my toe. I also had nausea. Today, the day after the sting, I have much less of those symptoms, but nausea, shakiness, and chills that come and go, and have been all day. The burning and stinging had spread to a larger area of my foot, but as of right now it is very, very minimal. Took more benadryl and ibuprofen today, which helps. Feels like I have a vrius, but not quite, and the sting site feels like I just stepped on an irritating barb from a weed. I think mine was a mild reaction, thank goodness. I was stung by what i suspect to be an arizona bark scopion. 6 times. I had very serious symptoms such as roving eye movement and muscle twitching. It hurt. I was numb for 3 days. But im fine now. I was stung a couple years ago, on my toe. The pain was as bad as when I broke my ankle. It was absolutely terrible. The intense pain lasted for two days, and went the entire way up my leg. It took 3 weeks before all of the milder pain and tingling and numbness stopped. A few months later a friend of mine stepped on a scorpion and got stung. His pain was more localized to where he got stung and by the next day he was fine. I don't know why my reaction and pain lasted for so long! Watching TV on couch last nite got up and felt strong stinging pain in my toe. Shook out my slipper and a large tan colored scorp appears. I killed him, washed the bite area with soap and water and took a benadryl pill. Pain continued for about 7 hours, now left with the tingling and numbness part. It spread from my toe to my entire foot. I've been told the numbness can last a few days. This morning at 1:30am I had fallen asleep with my jeans on and watching T.V.. I woke because I felt my right shin burning like crazy. I immediately thought either spider or scorpian and began slapping the leg. Bad idea... that critter stung me 3 more times in the same general area before I had sense enough to loose the pants and it. I had been told a scorpion sting was simular to a bee sting. HA I say to that!! I'm from the south and no bee ever felt as bad as this sucker does...even now, 10 hours later. It hurts/burns/tingles/is numb in areas ranging from my shins total area, up my inner leg to the crotch,(but not in the crotch area thank God) and my right arm on the outside is numb and tingling. Been in Phoenix for 8 years and have killed several dozen of these little bad asses, and now they got their revenge I suppose. Feels like it anyway. Doin' the cold compress and asprin thing for some temp relief. Yesterday i was sitting on the floor as the kids decorated the christmas tree. I was leaning against the couch. That darn scorpion got me on my lower back. I grabbed it and threw it twards my arcadia door. It was an adault size bark scorpion. I called 911 and they said i dont have to go to the hospital. Poison control said to put ice packs and take pain med. They called me twice within 3 hours after i got stung. It feels like i was getting a tattoo done on my back. Phx Az has so much this year. Its the 5th one we have killed. I was laying on my living room floor doing homework. I had shifted my weight and felt a sting in my elbow. I looked over and noticed a baby bark scorpion. I was in shock at that moment and immediately began looking up what to do. After it had stung me it just sat there and didn't move, so I thought it was dead. My roommate sprayed it and it began moving so I knew it was alive. It must've been playing dead or something. I called poison control and they told me what to do and what to expect. They also called me twice to check up on me. I experienced pain in my arm, numbness, numbness in my face, and some shortness of breath. I also spiked a fever of 99.2 but the poison control center the fever wasn't related..which is strange because I got it after I was stung. They told me I could be in pain for 24 hours but it's after 24 hours and my arm still hurts a lot. The pain radiates from my finger tips past my elbow. It hurts to even use my arm. Woke up at 5 like normal and decided to jump in bed for about 10 minutes or so. Turns out I landed on a bark scorpion who wasn't to pleased with me being there. He stuck me about halfway up my thigh. The only way I could describe the pain is if someone took needlenose pliers, heated them up in a fire, grabbed your skin, pulled and twisted. It was a terrible pain for about 20 minutes. Luckily, I didn't go into anaphylactic shock or have an dangerously adverse reactions. It has been about 15 hours since my sting and now I have about a golf ball sized area (diameter) that is numb on my thigh and I get tingling sensations every once in a while. Luckily, we tracked down the culprit and he was still chilling under my bed, so hopefully I don't have anymore uncomfortable encounters with scorpions. For several hours after I felt an ache but it's fine now. Washed the sting and took ibuprofen to calm the pain. we just moved to phoenix (glendale) a month ago. Since then, we had the exterminator out after killing 6 scorpions in the house. After the exterminator came out, i have killed 4 more. But last nite one came out from under the couch and got me on the toe!! They are small and light tan so I am assuming they are Bark Scorpions. The pain was really intense at the bite site!! i'd put it up there with getting shot (done that also..) but not quite as bad as getting a catheter or passing kidney stones (done those too..why do i have all the fun?) The wife treated with washing and wrapping in cold towel. Ate some tylenol and went to bed. Pain lessened overnite, but my leg is still all tingly. I guess it comes down to having an allergic reaction or not. I didnt. I guess I'm lucky. I got stung around 1am going to the bathroom. In step of my left foot. Brown one but not that large. The pain was unbelievable and 4.5 hrs later still is. Called Banner Health and since I did not have any other symptoms other than numbness & tingling, they told me to wash it & use cool compresses. They informed me it will take about 6 hrs before it gets better but the pain at the sting site can last for weeks. I was getting out of the pool bark scorpion was in my towel. we called poison control and I was brought to the emergency room. My chest was tight and I was numb. Everything was blurry. I hated it. I get out of the emergency room and go home. I had never got stung by a scorpion but now I know what it feels like. 48 hours later I am still in pain. My neck is stiff and my vision is going back to normal. It's been almost 48 hours and I'm still hurting and numb. I stepped on a bark scorpion in my closet. Called 911 when my tongue thickened and my eyes wouldn't focus. My foot still hurts and I still have tingling in my both legs and arms. The exterminator comes Tuesday. Systemic reactions are no fun. My first sting earlier this year was only localized for a couple of days. I stepped on a bark scorpion in my kitchen with bare feet. It was the worst pain I have ever felt, stung between my toes. My foot/leg felt like it was getting cut off, jabbing, firey pain. Took 2 benadryl, 2 tylenol - 10/10 pain rating. I am no wimp...my mouth and lips became numb..then later came my throat...then my eyesight began to become blurry. Obviously I had a bad reaction. I am a Nurse Practitioner so I know how to handle stings....but...OMG it was the worst thing I have ever experienced. I don't walk around the house EVER without shoes on. I didn't think I was going to die...but I knew immediately that I was going to suffer....and I did. Tonight my dog got stung in the backyard by an AZ desert scorpion - it's huge, I have it in a bucket in my kitchen. I called ASPCA Animal control..I just have to just wait and see. I have lived around scorprions for about 20 years, and have never been stung. I've lived in AZ since 1994 and had several 'stings' from scorpions... however, none had been a bark scorpion that causes body limbs to go numb yet react to touch of a feather and I am still somewhat disoriented 48 hours later...with a dull head ache and overall fatigue. The other stings were similar to that of a bee sting, I put ice it and in couple of hours it was gone... this bark scorpion was hiding inside the roll of toilet paper at a very popular hiking area bathroom. So when I reached for the roll, my finger was immediately stung! The nausea stopped after 36 hours, but my arm still aches. I'm hoping to be out/about tomorrow.... I never knew about this little guy but will definitely watch for them now! I have had some painful experiences in my life, but scorpions do not count. The latest feels like a 1/4 strength bee sting, with some tingling. I must have only mildly perturbed my six legged friend. This is my third encounter. When I was eleven, I received a bite on the back of my knee, on a Boy Scout camping trip where you were not supposed to speak for three days, live with one match and one egg, etc. Walked right up to the scout leader and told him what happened. The other, I got into bed and it was in between the sheets. This one is the mildest of all three. If I had been so inclined to obtain a Medical Marijuana Certificate, I am reasonably certain such would have come in handy at this point. My son and I have lived in Arizona 8 years. Every year our persian cat catches & kills 3 or 4 scorpions that make their way into the house through crack in bottom of door or through ventilation overhead. Scorpion followed a spider into the house from front porch. Kitty pointed out problem right away & we watched it move in & out & back in again. If you let them, kitty will play with, then kills them. Get yourself a housecat! I've just been stung for the second time (first time on my upper arm) on my upper thigh. Stung me right through my clothes and I saw the little sucker go scurry off under a throw rug. Let me tell ya..... don't get stung by one of these little aliens cause it hurts like a sonofa @!#$%!!!! I have an ice pack on it now but it's hard to even walk around! Feels like someone keeps sticking a hot needle in my leg with radiating pain coming from the sting sight! I woke up this morning in excrutiating pain. My upper right arm down to my finger tips felt like someone was jabbing white hot needles in and out of me. I couldn't move my arm and I was really sick to my stomach. I called Banner Health and described my symptoms. They patched me through to Poison Control. Sure enough, SCORPION! They told me to wash the effected area and ice it, which I did. They were extremely nice and even called me 3 times during the day to make sure I was ok. Six hours later, I felt well enough to look for the culprit. I found it under a couch cushion DEAD. I was really lucky, it was a bark scorpion and although I am still in A LOT of pain it was a mild invenomation. I have lived in AZ all my life, I have seen a ton of scorpions. I am the only one I know that has been stung by one. I now have a great respect and even greater fear of them. Time to move to Iceland! thanks for the photos posted here on About.com, I was able to identify my culprit as an AZ Bark Scorpion. UGH. I killed it (5 times, with my shoe !!! ) and took it with me to the hospital. My foot hurt like CRAZY and the pain radiated out pretty quickly. I went to the local ER right away, after putting ice on my foot, ice didn't seem to help. The ER doctor injected something into my foot that stopped the pain, and stopped it from spreading. No muscle twitches or eye-rolling, thank God! Time for an exterminator...5 scorpions seen inside the house in the last 4 months. Husband doesn't agree and won't get an exterminator. But he hasn't been stung. Yet. I got stung in bed while I was sleeping. Other than some mild swelling at the two sting sites and a little tenderness, it wasn't too bad. I've had paper cuts that were worse. I didn't experience any of the other symptoms. I just put a cold pack on for about 30 mins and by the time I got up for the day, it was just two little red dots. Was in the garage taking something out of the cabinets. I felt something like a red hot poker being stuck right between my toes. The burning traveled up and down my toes. I called poison control. They said, cold compress. not ice. The venom affects the nerves so ice isn't a good idea, take a painkiller. The pain lasted a few hours and then just the numbness. lips, tongue, back of neck and foot. Poison control said the pain, numbness can travel anywhere in the body. I was in my bathroom leaning over the sink, and I felt a pain on my right big toe that was so bad I immediately dropped to the floor and that's when I saw the scorpion. My whole leg and throat became numb seconds later. One week later the sharp pains are gone but I have no feeling in my big toe. I can't even bend it without the assistance of my hand. I have no control of it so I called poison control and they said it must have been an Arizona bark and effects could last up to 20 days. Stung on my right foot, sharp pain but bearable. In about 15 minutes I began to feel tingling on tongue, lips. Right leg went numb. Both arms, left foot went numb. Within the hour jittery vision, unable to concentrate. Couldn't drive. Went to ER and got two doses of Anascorp, an anti-venom. Doctor said I was close to shock. After about one hour, symptoms went away, but foot still hurt with sharp pain. Next day some residual numbness in right foot. We have a trailer at Lake Mead and in over 20 years I've only seen a scorpion in the house once, many years ago. I was getting ready for bed and reached for a hand towel and felt a sharp stab/burning to my index finger. I took the towel from the rack and turned it around and there it was. Pain, no swelling or redness, and numb and tingling in the morning that diminished as the day went on. Picked up a cardboard box and put my hand right on a bark scorpion! The sting felt like a knife slice to my right pinky finger. Immediately the finger began tingling and a throbbing pain started shooting up my arm. Called Poison Control and they advised a cool compress and Tylenol. For first 24 hours the pain, numbness, and throbbing extended from finger to elbow. The cool compress really helped. Now, four days later, all the pain is gone and only the finger is still numb. Poison Control said the numbness can last for several days. I guess the severity of the sting depends on several factors, including how much venom the scorpion was able to inject into you, and how sensitive you are to scorpion stings. I was stung on the side of my foot. The pain was excruciating! Paramedics came, said take Benadryl no more than 50 mg and cold compress.12 hrs later I called Poison Control. They said the time has passed for an allergic reaction and that I should start taking Tylenol or Ibuprofen for pain management. 36 hrs later I am able to bend my toes. I was paralyzed from toe to midway to knee, plus each nerve ending was on full alert. Got better the next day and I was able to at least put on a flip-flop. I put my pants on and I felt the sting in my back mid thigh area. I knew immediately it was a scorpion. When I shed my pants the little devil popped out, I trapped him and then washed the area but I could not see the spot. Stung like heck in that spot. Appears to be a bark scorpion but I did not seem to have any adverse reactions. I have been stung several times on the hand while camping and know better than to just put on boots or clothes without a check first. Our 18-month old tried to pick up a bark scorpion in the house and was stung. We had been seeing a lot of scorpions (about 30) in the previous month and were paranoid enough already. For a child this young, an ambulance and trip to the hospital is a must. Our little boy had a horrible reaction, as the venom attacked the nervous system. He couldn't see and his body was out of control for about 3 hours when the anti-venom they gave him at the hospital took effect. He had to have two doses of the anti-venom (antivenin) for it to work. Luckily, once it kicked in, he fell asleep and woke up the next day as if nothing happened. i was stung five times by a striped tail scorpion in my bed! I have killed 3 kinds of scorpions in my home: bark, stripe tail, giant hairy. My stings were a little painful but I remember burning sensation for a day in the areas of the stings. If you have annoying relatives from back east who want to "vacation" at your home, just tell them about your scorpion problem. One pest cancelled out the other. I was carrying a box to the trash when I felt a searing hot pain like a needle had been drilled into my thumb. My hand began to tingle and waves of pain, went to nearest ER, given benadryl and a tetanus shot. Stayed two hours for observation, I told the doctor my throat and tongue started to feel funny, and I was having trouble focusing. The doctor said that is not a symptom from scorpion bite, it was my nerves. He discharged me. I went home, tried to drink water felt like acid. My feet began to feel numb, then my left hand began to tingle, called poison control was told to go Banner Desert, since they specialize and have antivenom. Learned that there are 4 levels of reaction I was a high level 3. When they finally brought the anascorp, first dose my eyes began to focus better, after second does my left hand and arm were back to normal. By this time I was 75% better, took some motrin. An hour later all the symptoms were gone only the initial site on my thumb still tingled no more pain. The next morning just the tip of my thumb was still numb. I have been stung before and it hasn't been a problem, nothing more than a bee sting. My wife, on the other hand, is allergic to insect stings and had to seek immediate medical attention when she was stung. This morning while in bed just before dawn, I was stung on my left ankle by a small bark scorpion. We found it hiding beneath a pillow. The sensation this time is different than the last time I was stung. While I am not experiencing much pain, my leg, from the middle of my shin to toes, is very numb. I have taken Benadryl, applied a cold compress and elevated my foot. One of the worst pain ever..no joke! As soon as the scorpion stung me, I immediately felt the severe pain. It was as if I had 100 pins went through my toe and foot. .I went to the bathtub and had cold water run over the affected area. I washed the area with soap, even though I didn't want to touch it, I knew I had to. Following that, I elevated my foot, making sure it was above my heart. My husband put a cold ice pack with a damp wash cloth in between affected area and ice pack to prevent frostbite. I had cold compress on my toe for 10 min. and kept leg elevated for 30 min. Are Cats Immune to Scorpion Venom? Got Bit? Got Stung? Call the Hotline! Truth or Fiction: There Are No Earthquakes in Arizona. What's It Actually Like to Live in Phoenix? The Nearest Beach to Phoenix is in Mexico...But Should You Go?